A Celebration of Creative Punctuation, Bethany Keeley, Chronicle Books. “People are developing new and exciting ways to use the quotation mark every day,” writes Bethany Keeley in the introduction to The Book of “Unnecessary” Quotation Marks, which as one might expect, is devoted to illustrating misusage of quotation marks. Each of the books 176 pages includes one or more examples, along with commentary from Keeley, who has been operating the Blog of Unnecessary Quotation Marks since 2005. The concept works better online than in print, as its essentially a one-joke book. Whether the signs are found at work, at the store, on the menu, on the road, or in the bathroom, the word (or words) in quote marks are almost always an expression for insincerity, sarcasm, or disbelief, or perhaps code for something else. How many times can you look at pictures of signs that read: Sausage “sandwich” or “Security Guard” before the joke gets old? On the other hand, the book does a good job of driving home how not to use quotation marks, while reminding the reader that they are sometimes used deliberately. “Quotation marks are a great way to make promises without being bound by them. Put it in quotes, and it’s clear that you only kind of mean it,” concludes Keeley. 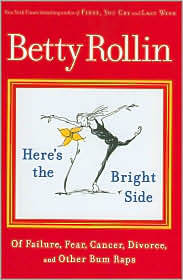 Book on the Bright Side—Here’s the Bright Side: Of Failure, Fear, Cancer, Divorce and Other Bum Raps, Betty Rollin, Random House. Charles M. Schulz—M. Thomas Inge (editor), University Press of Mississippi.